Lots and lots of WIP in my life still, but look at all the projects that moved up on the list to Finished in just one week. 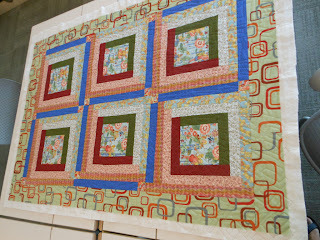 with all these Finishes I'm linking up to Crazy Mom Quilts too! I had fun trying a new quilting technique with my walking foot and Aurifil 40wt. 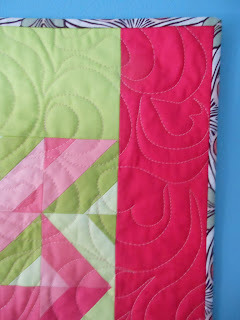 A full reveal of the secret swap will be shared next time once my partner receives it at our SBAMQG meeting on Tuesday. 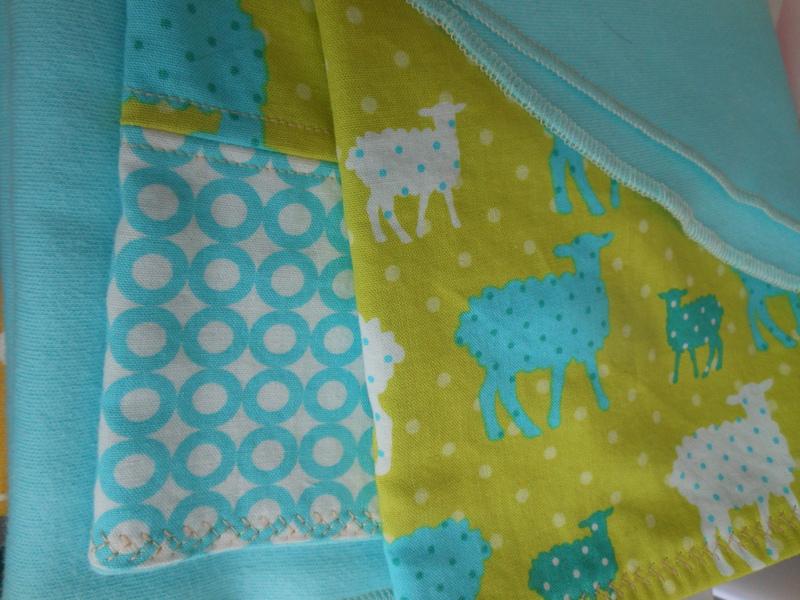 Ring Around the Briar Rosies still needs a proper photo shoot but I wanted to share an attempt at photographing the FMQ details. It isn't often that I bother controlling the areas but felt like this quilt deserved the extra attention. 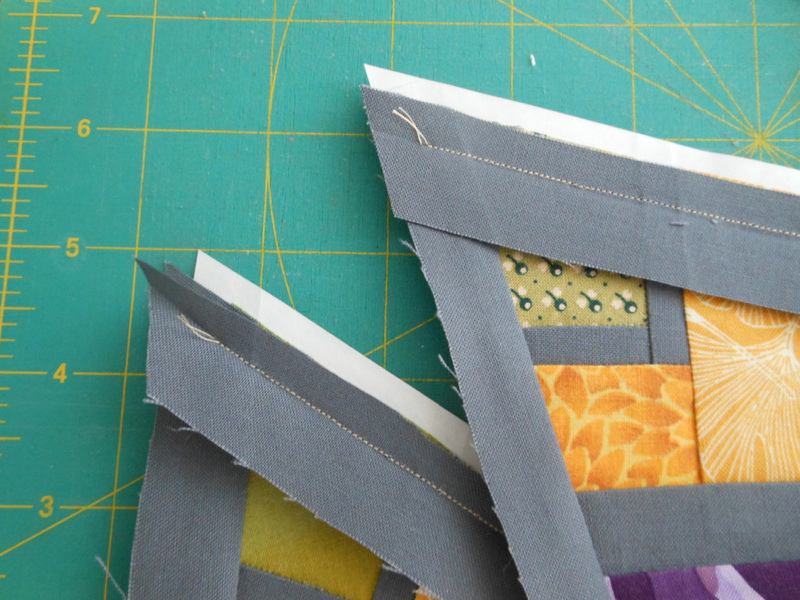 No excuse for not having gotten started on my son's Parsons Gray quilt, fabric is abundant. I'm likely going to pull the blues, greens, grays and lights to use. What style or pattern do you think would be good? I'd love to have you comment. Linking up to WIP Wednesday with Lee at Freshly Pieced. 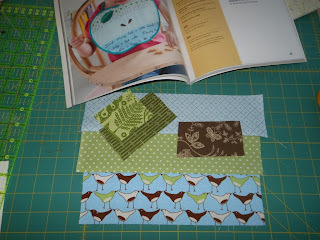 Pop over and check out the other participants as well as a peek at her new book Vintage Quilt Revival. It feels especially gratifying to complete a goal when you're feeling overwhelmed doesn't it? 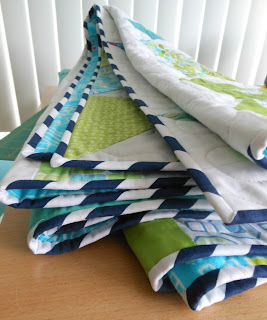 The cradle set including bumper pads, sheet and quilt were my goal described in this post. 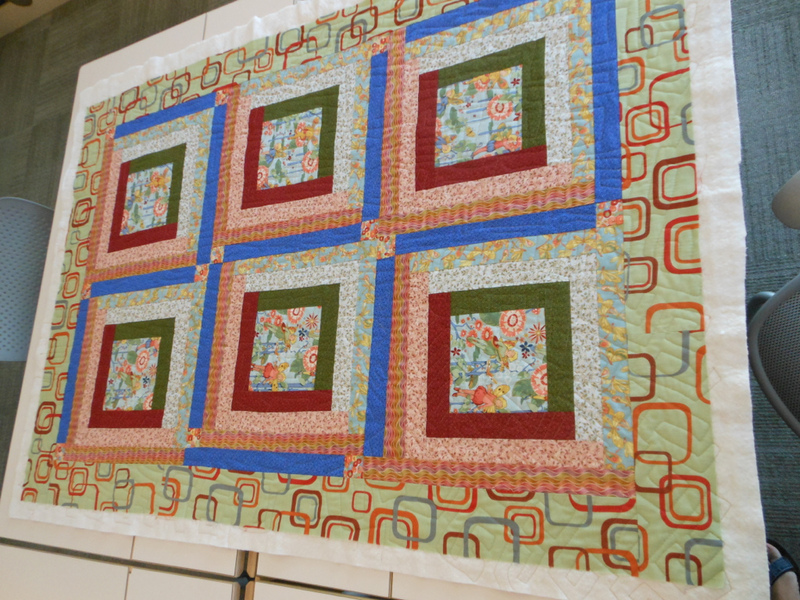 I'm happy to have just stitched the binding down on the quilt to complete the last of the set in time to link up the the Finishes Party. 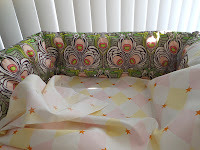 I'll try and add a photo of it in the cradle later on and with better lighting. 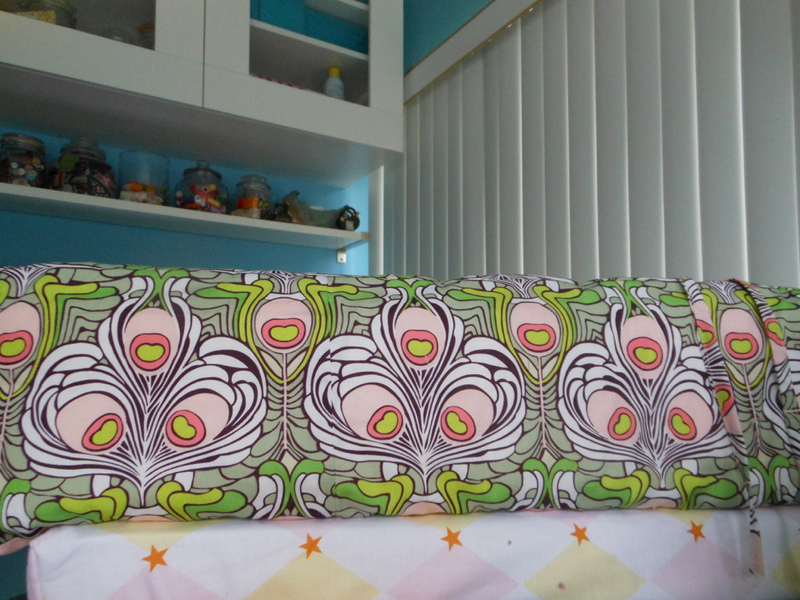 I'm really happy with the thin binding and glad I decided to use the Art Gallery fabric on the back. 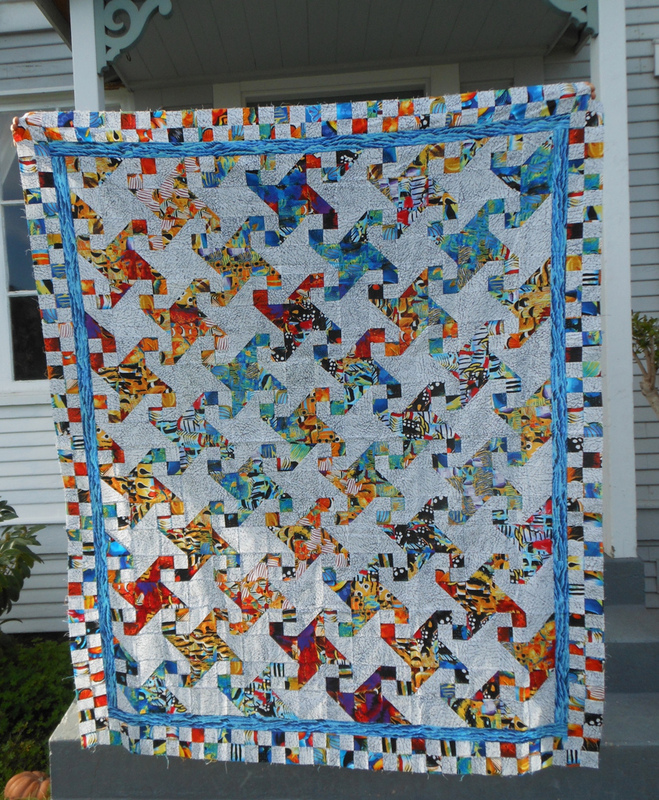 Check out Fiber of All Sorts or Sew BitterSweet Designs to browse and encourage other quilters and think about picking an August goal to join in. 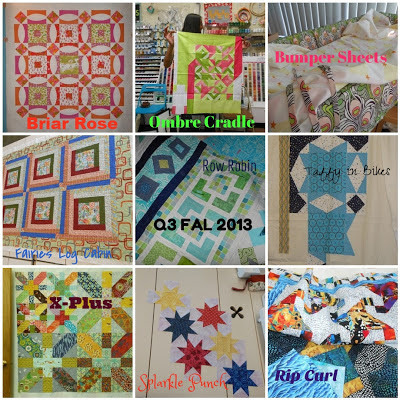 These were also part of my Q3FAL goal mosaic which puts me at 5 out of 9 projects crossed off. 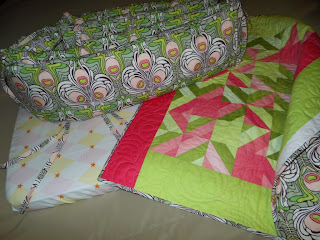 Linking up to Sew Cute Tuesday at Better off Thread - pop over and help celebrate her blogiversary. 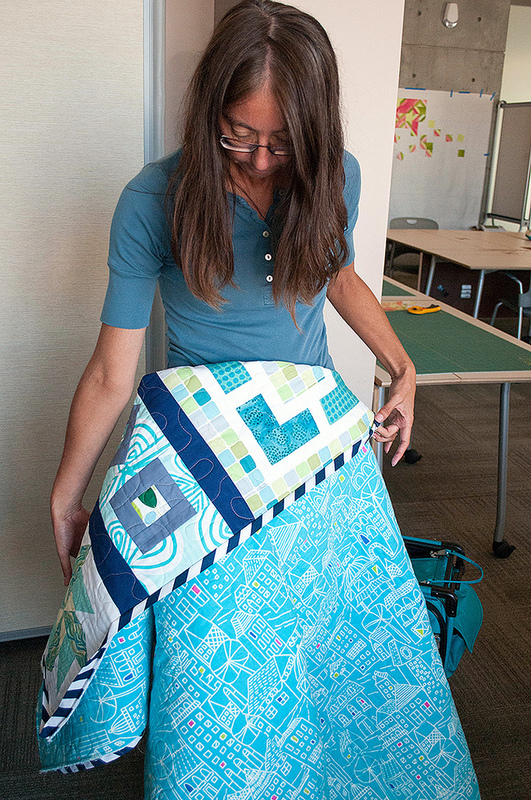 This week I finally made it to Open Sew at Intrepid Thread in Milpitas. Wow, Julie has outdone herself with the brick and mortar shop. 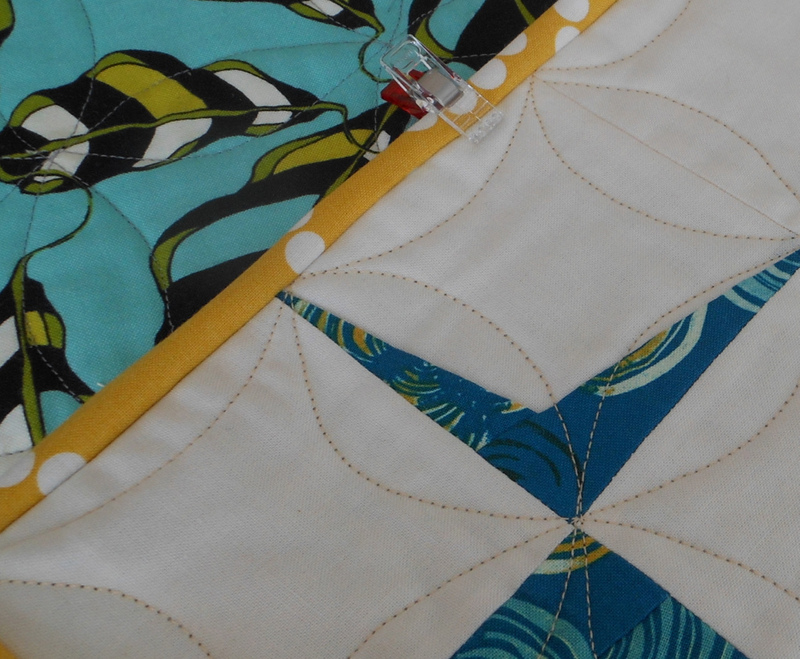 Loved every single bolt in the place and all of those display quilts -let's just say my to do list just quadrupled. Rather than assigning us color combos we got to choose a month for inspiration. 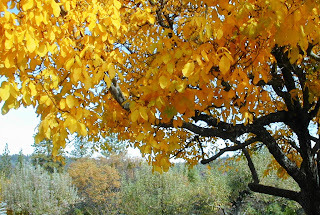 I chose November and explained on my flickr picture it was to represent the reddish color of the buildings and the gorgeous blue sky at our SBAMQG 1st Annual Fall Retreat. Although green would've been an obvious choice for the 3rd color to symbolize the redwood trees, I didn't want it to look christmassy so I opted to batik bomb the center with grey for the foggy skies of Capitola left behind that weekend. We also joked that it could be the grey hairs that I got from learning EPP from a lefty at 2am. We visiting possible venues for this year, yippy, here we go again! Can you guess what the three colors in the other block are all about? 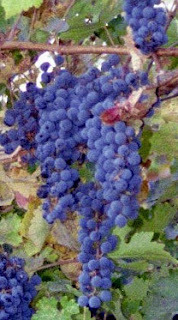 On flickr Linda commented it might be grapes and bananas and got it half right, sort of. Think of crushing grapes - like the episode of I Love Lucy. I'd like to try one without the inside grey - what do you think? 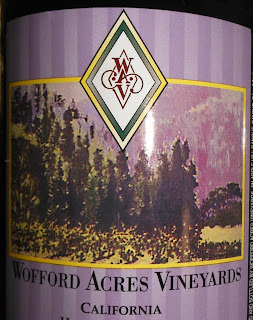 On several occasions, I've used my birthday in November as an excuse to go visit my friend Ann and her family at their winery in El Dorado Hills, Wofford Acres Vineyards. 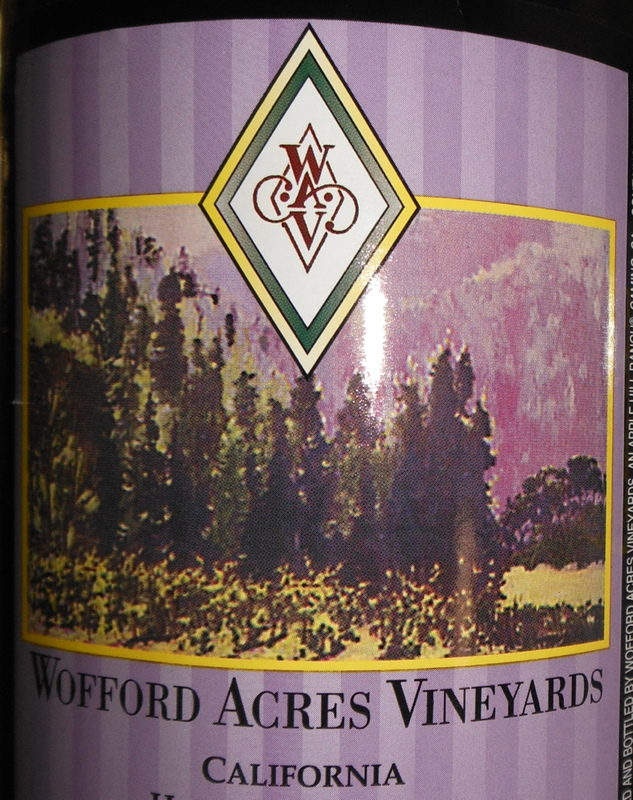 Not only is the wine award winning, but the view at sunset is spectacular. I've taken hundreds of photos and played around in photoshop - here are a couple of favorites. 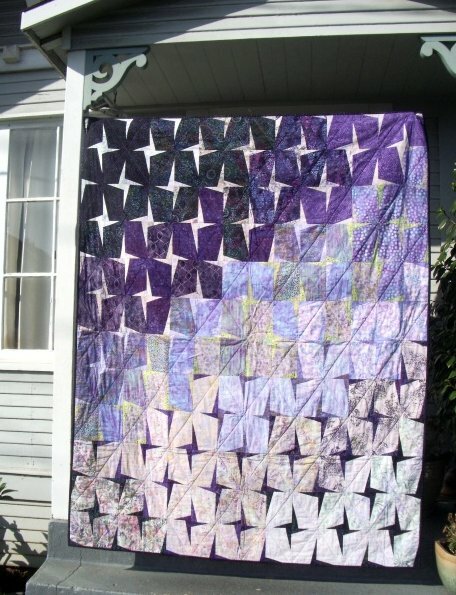 My crystal block is not the first time WAV has been a quilting inspiration. 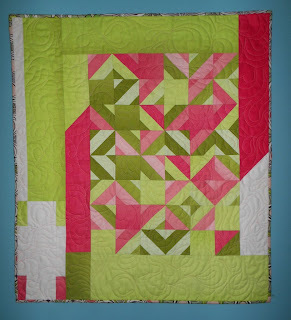 This one is titled "CRUSH" made using Cheryl Malkowski's pattern shown here. It originally transitioned in the center to green blocks but that didn't quite translate as I'd hoped so instead there are little sliver hints instead. If it looks familiar, it's probably because the design for last years F+F quilt and block tutorial for Tassels was inspired by this quilt. The yellow ring represents my birthstone Topaz - stealing the idea from Linda Beth's green block Peridot. When I was browsing pictures of the winery I stumbled across this lovely shot of the tree I sit under to drink my morning coffee and realized it could have been the source of inspirations as well. 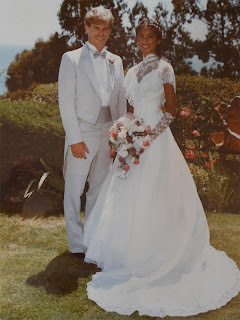 I'm including my lesson learned photo - to remind myself not to repeat the mistake. 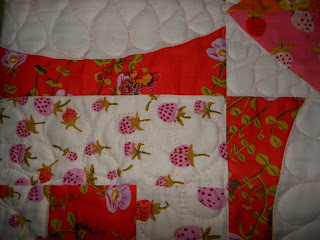 Picking out 1.6 stitch size is challenging. The baby shower is a couple of weeks away and I finally finished up one of the gifts. 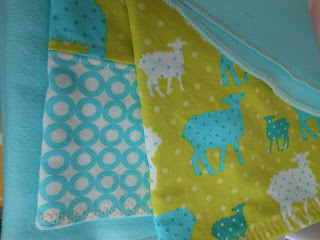 Hopefully I'm not spoiling the surprise by posting a sneak of the Moby-style Wrap. 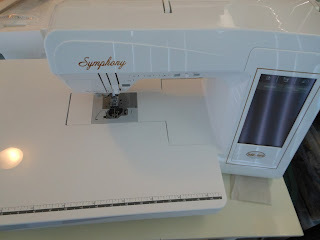 My SIL invited me over to use my niece's serger to finish off the knit. 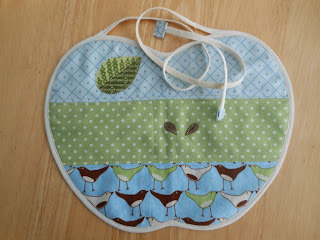 I have only used one once at Sewing Summit and had forgotten how much fun they are. 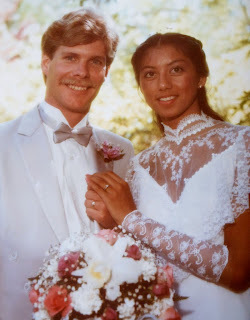 Yesterday we had our 30th Anniversary. 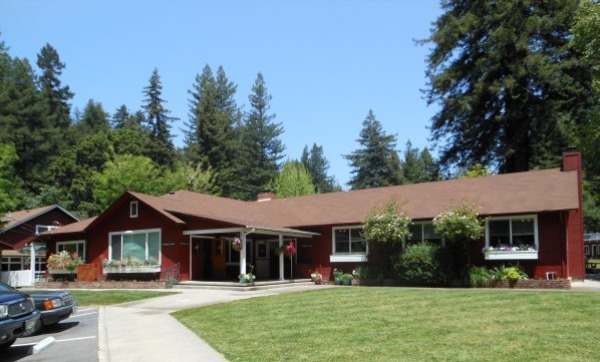 Signing off with these two pictures from when we said "I do"
Fall Quilt Retreat - visited venues, decisions made! After sewing the centers together with the wrong orientation I managed to attach them incorrect again and didn't notice until the borders were on, after unpicking, rotating the squares and resewing them back, I have renamed the quilt from Taffy in Ride to "Tire Rotation"
Log Cabin Fairies binding on - all done! 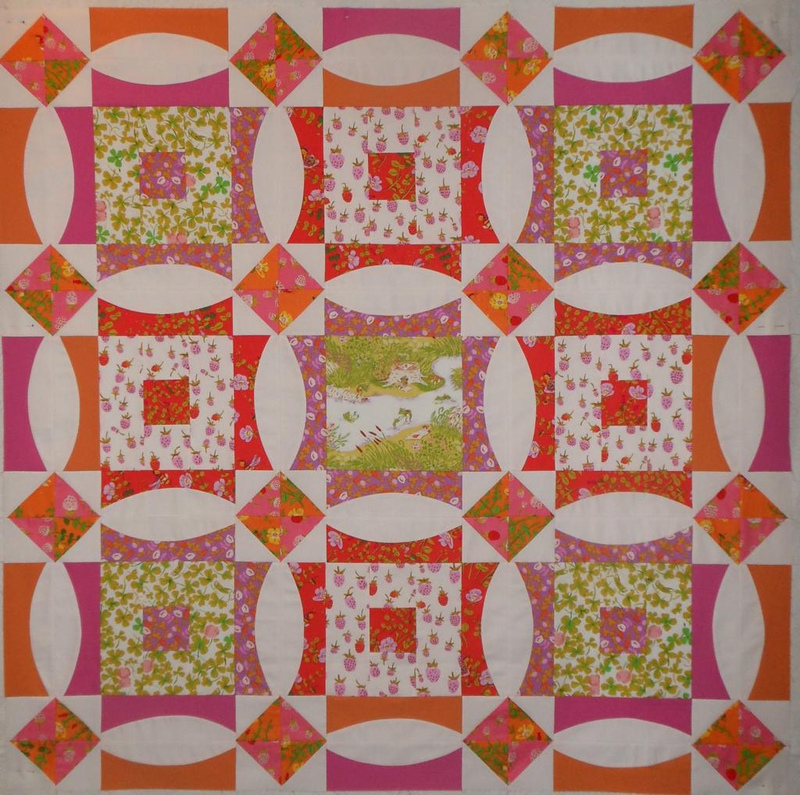 My Heather Ross Briar Rose quilt has also been officially renamed to "Ring Around the Briar Rosies" and I'd like to remake it in blue and greens to call the pattern "Skipping Stones". 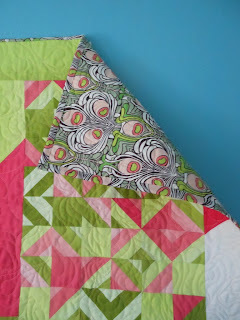 Linking up to Finish it Up Friday with Amanda at Crazy Mom Quilts. Lucky duck is on her way to a weekend retreat and to Whoop Whoop Friday where you can see Sarah's bit of Christmas in July. The list of things To Do still outweigh the others and yet I'm moving forward and that's what matters, right? 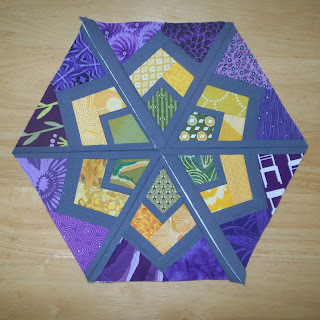 Linking up to WIP Wednesday with Lee at Freshly Pieced. 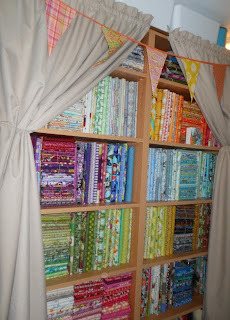 Sewing Room ReDo - keep tackling notions! 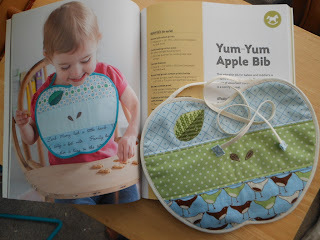 My new Patchwork Please book arrived just as the kitchen chapter was wrapping up and the projects for baby began. 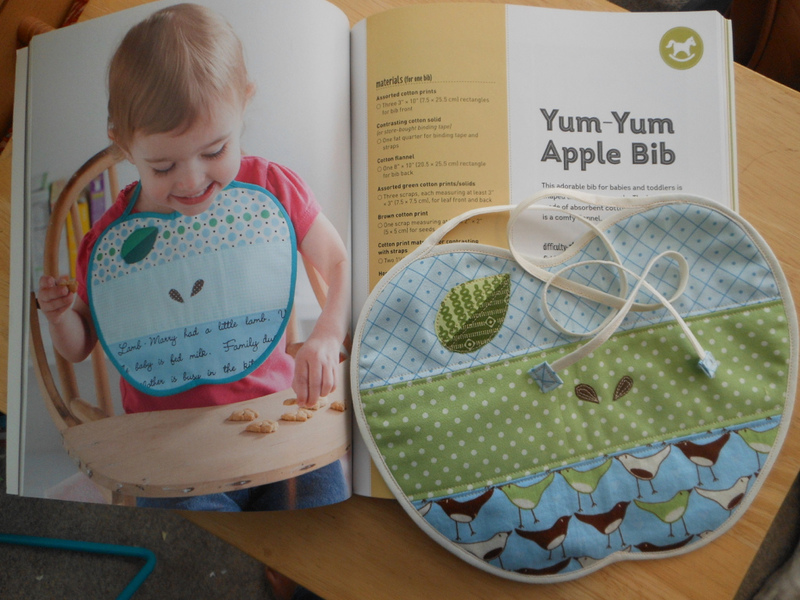 I'm so happy to have finally linked up to the Zakka 2.0 SAL with this adorable Yum-Yum Bib. Dozens of fabric strips were auditioned and it took me a ridiculous amount of time to decide - probably longer than actually sewing it. 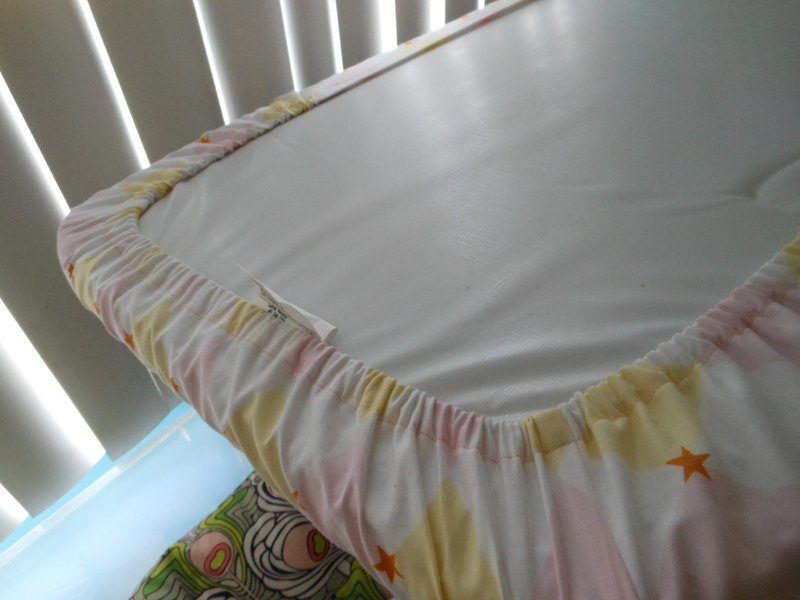 I used packaged bias binding and stitched it down my machine - but other than that I kept to the directions. Tomorrow's Dino-Mite Hat is scheduled on the hop- talk about cute! I just love seeing how different all the versions are. 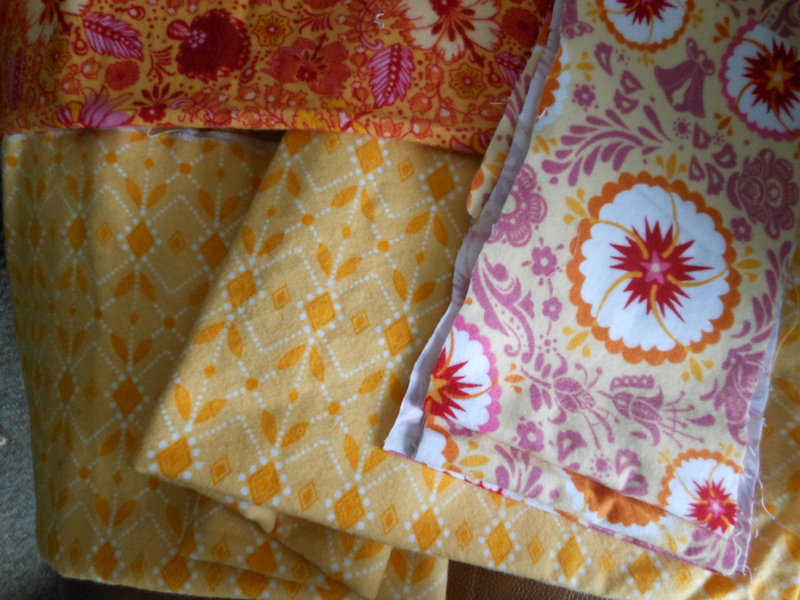 I'm not sure if I'll partake in the Books for Baby Quilt since I'm juggling way more partially complete baby quilts than any human should. 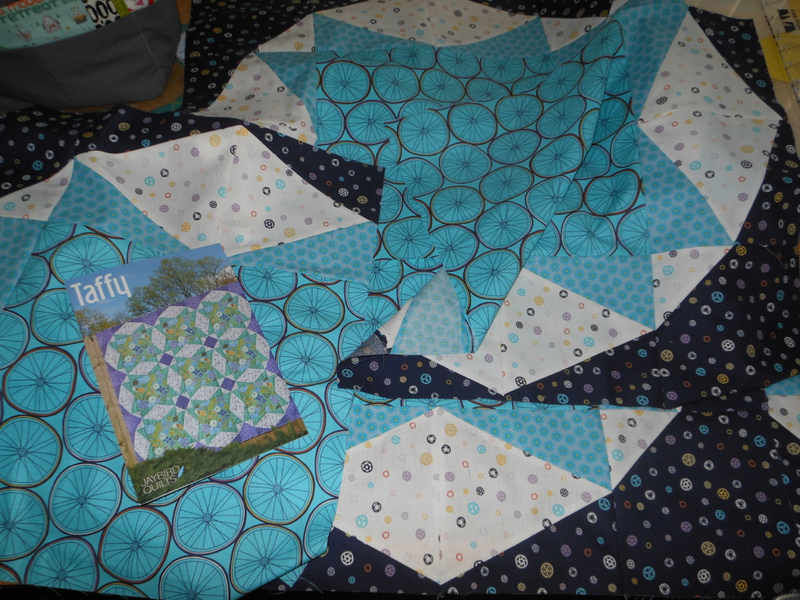 In fact... here's my progress of Taffy in Bike spread out on my bed. Really missing the design wall. 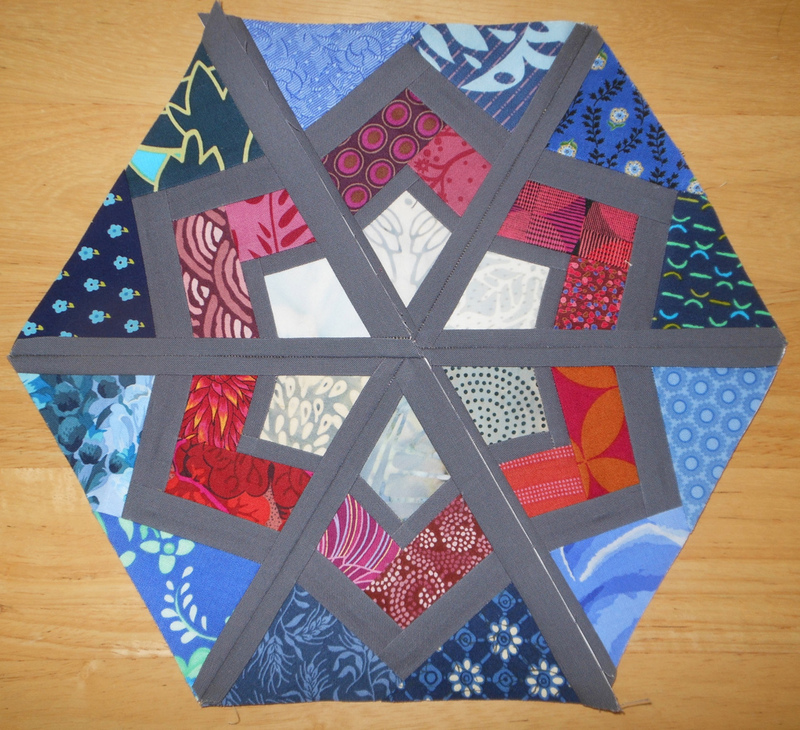 The parts are being sewn together in chunks because I didn't remember that the center wheel square was directional and attached the sided oriented wrong. 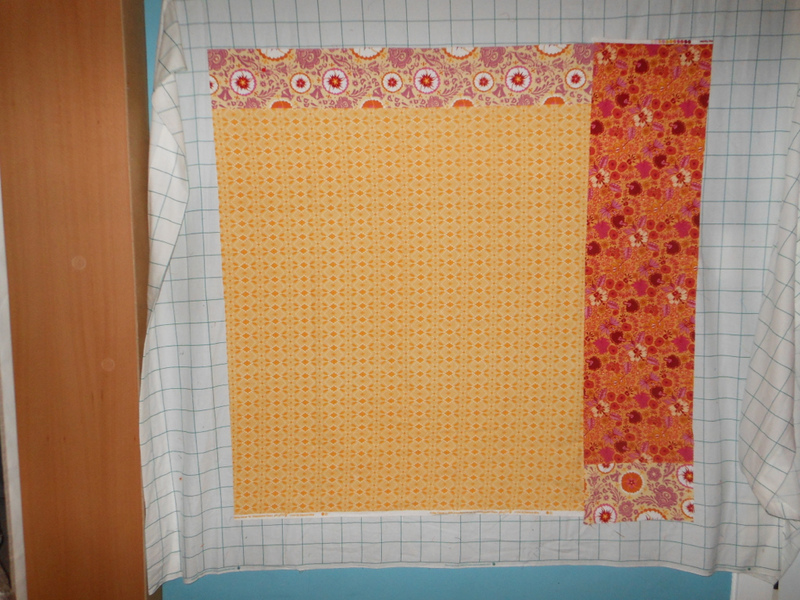 Instead of unstitching I decided to just group them rather than sew in rows. 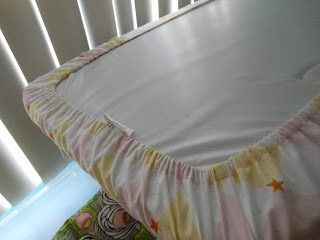 With seems ironed open, it's all the same in the end. Two more finishes to share: The cradle sheet needed elastic and I hunted through my notions and came up with nothin' so I bought some and now it's complete. 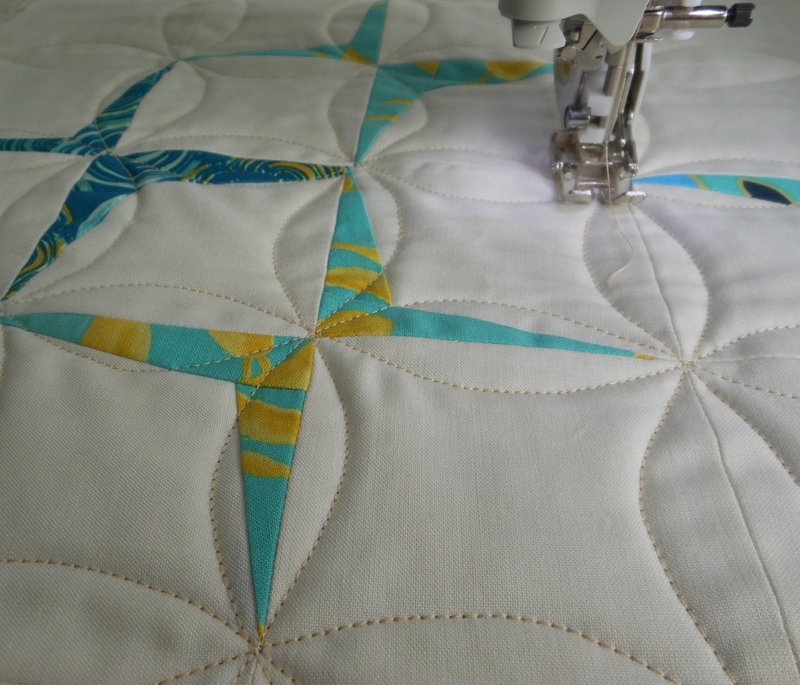 My July Goal for ALYoF is the cradle set and now the sheet and bumpers are done so that leaves the quilt: linking up to mid-month check in. The binding is also on the latest of my donation quilts to our SBAMQG charity group Pay It Forward. 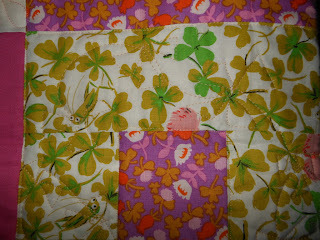 I'll be turning in Log Cabin Fairies at our August meeting and will get a full shot of it to post. 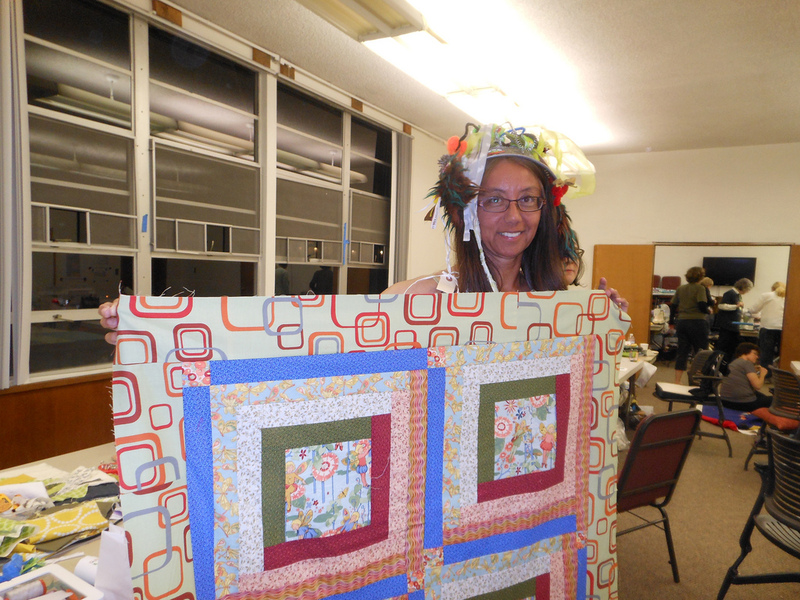 Thanks for all of the quilt name ideas on flickr and facebook. 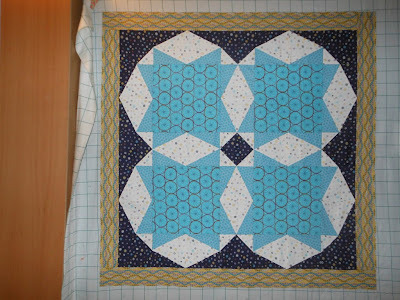 I've decided to call this one Ring Around the Briar Rosies thanks to Anne & Emily and the pattern design name is Skipping Stones as suggested by katedeerie who said: "the circles kind of look like the plips in the water after a rock skips across them". 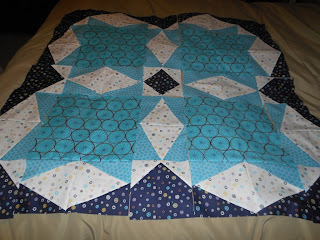 Now I just have to make one in blues! 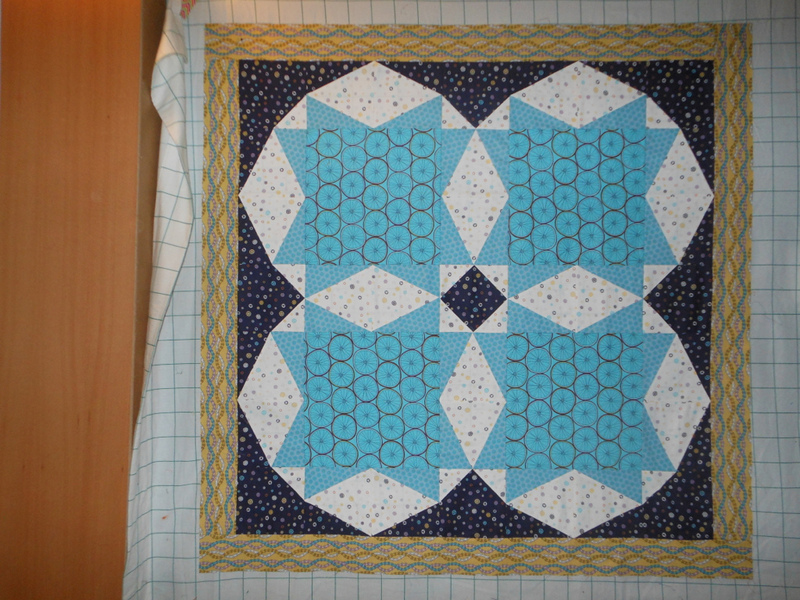 The pieced backing of Anna Maria Horner flannel is all complete so next up is sandwiching. Maybe I'll work on the back for Rip Curl so I can do both at the same time since both are Q3 FAL goals. Happy 1st Birthday to my sewing machine - I had it cleaned on Friday. It's done me good and I want to keep it that way! A lot of other BabyLocks come with girl names like Elizabeth, Sophia, Jane, Grace and Molly but mine doesn't - I really should just give her a proper one. 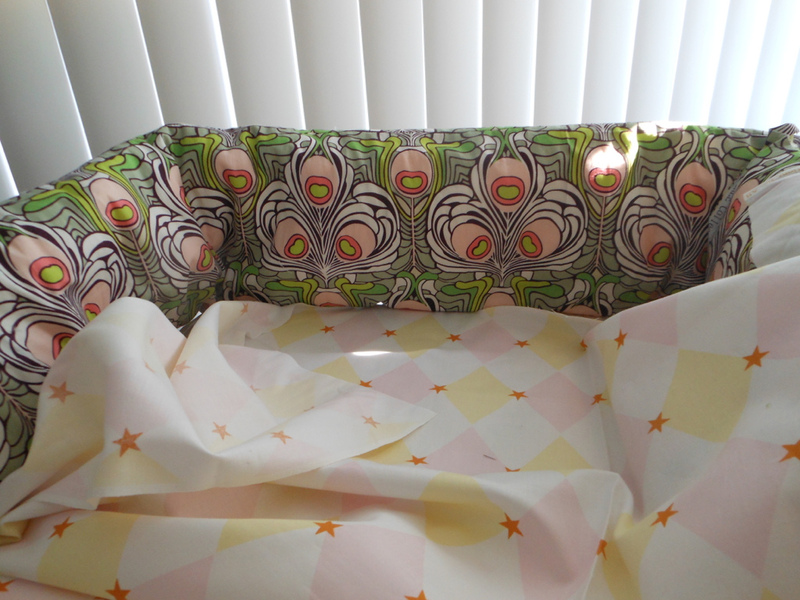 I'm super excited about my (new) finished top made from the adorably vintagey line from Heather Ross, Briar Rose. I made it using the Quick Curve Ruler QCR and created a design that feels sweetly traditional. 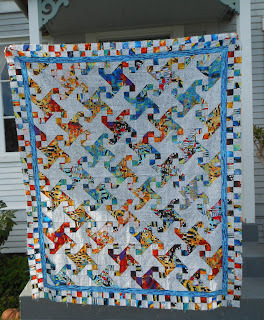 Help me give it a proper quilt name - any ideas? Usually I like to use contrasting colors for the backs of my quilts but I am trying to be good about pulling from stash. 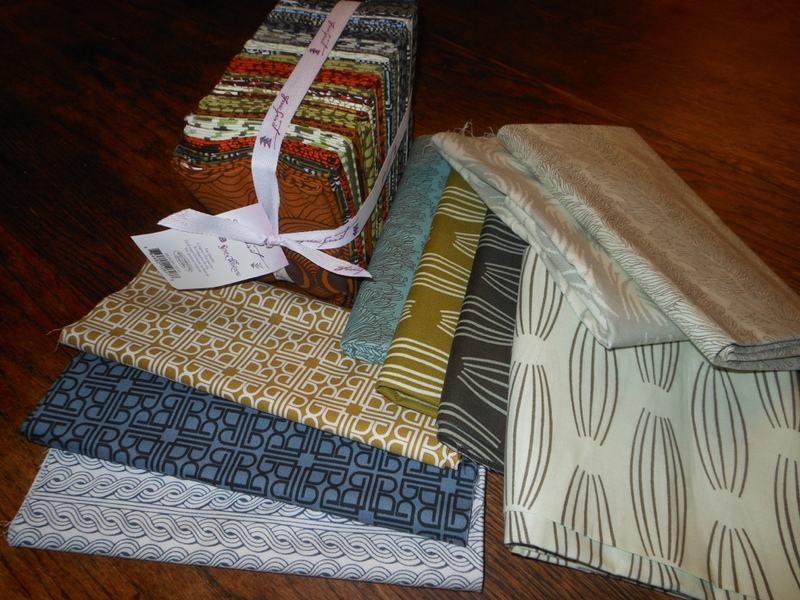 These lovely Anna Maria Horner flannels should play well with Briar Rose and a pop of green solid binding will give it a nice punch. 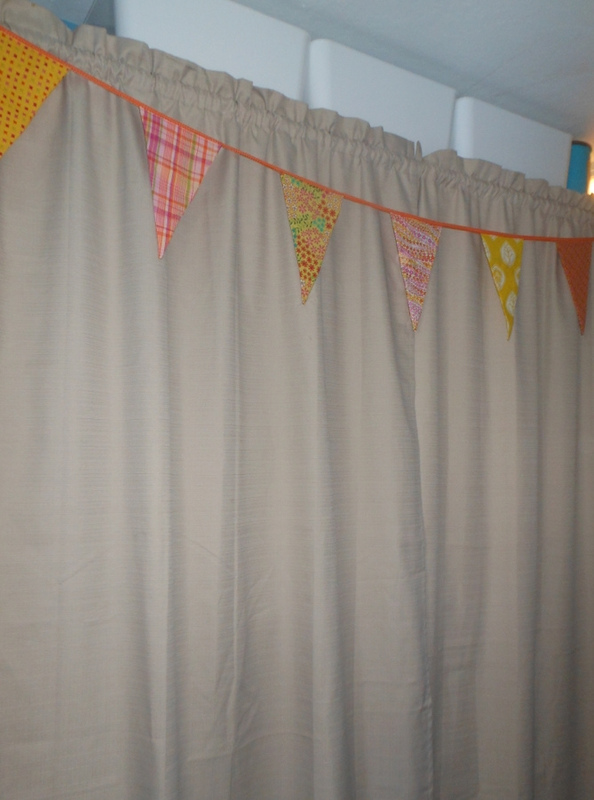 The Sewing Room Redo finally included hemming the room darkening drapes and installing them to help protect the precious. For now, I'm just pulling them to the side with some twine so that I can enjoy the view while I'm working in there. The bunting from Sewing Summit makes it a little bit more festive when they are closed. 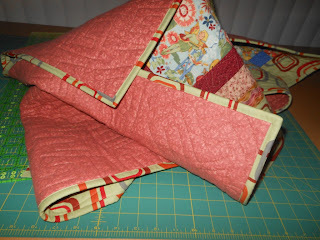 Sorting of notions is still to be done but I managed to relocate my quilt books. 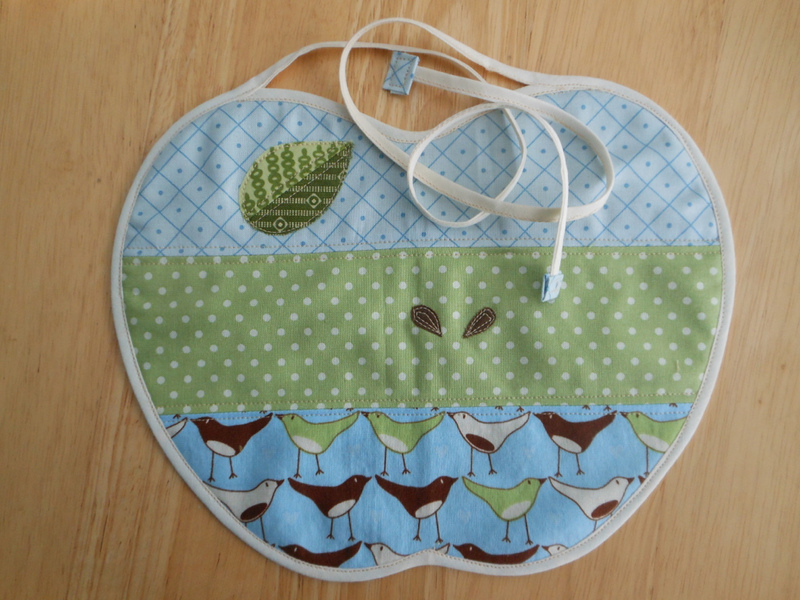 It felt good to hand stitch the binding on Row Robin. Although I'm glad I discovered and embraced machine stitching it for the charity quilts, I have missed this step. 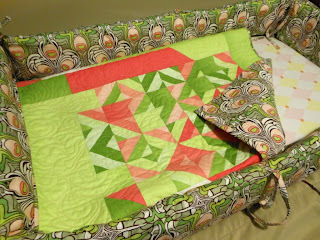 Linking up to Finish it Up Friday at Crazy Mom Quilts with three whole items all the way done and to Show Off Saturday at SewCanShe. Sewing Room ReDo - tackle notions! 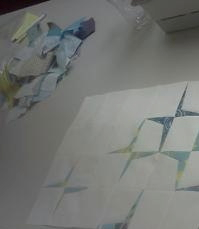 Not surprising, I was overly ambitious while creating my goal mosaic for the third quarter of 2013 Finish along. That's OK because I'm kind of hopeful at the same time. The summer months are going to fly by - new projects are going to get tossed in the mix no doubt. Oh well, that's OK too. Last quarter I finished these 4 out of 8. First up #1 is my latest obsession - the new fabric line Briar Rose by Heather Ross. 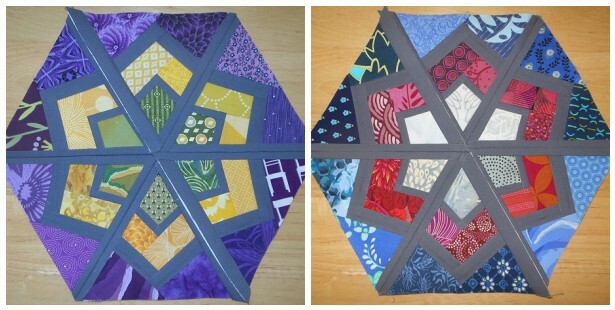 I dropped the ball on the QCR Urban Nine-Patch QAL: signing up, choosing fabric and then doing nothing. 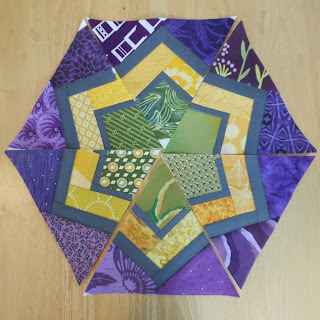 Ever since I made these 4x5 swap blocks at our MQG Retreat and Driving in Circles for Madrona Road's challenge, I have wanted to design something original and finally have. 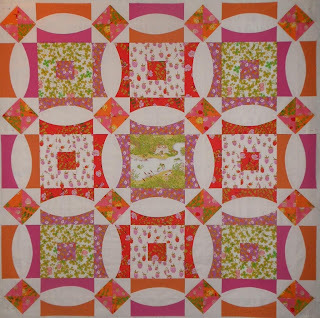 Briar Rose has such a lovely vintage feel and I think the design captures it well. 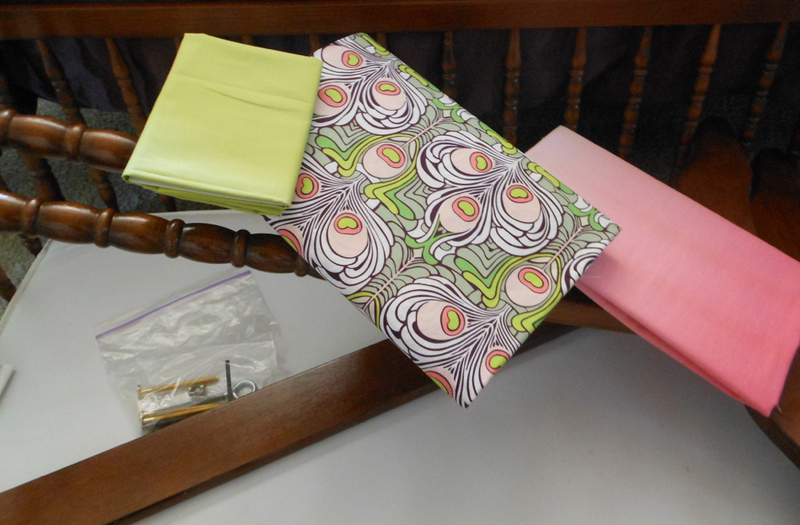 For the centers and arches I used just 4 of the fabrics along with 2 Windham solids and kona white. Originally I was going to set on point the cornerstones with the same fabrics but instead headed back to Hart's and picked up two more. Contemplating binding in a green. #2 and #3 go together: The Ombre quilt and Art Gallery peacock feather bumper pads and cradle sheet for my granddaughter, due in September. Here's a shot of how it all began. As of now, the top is done and I need to make the quilt back, sandwich and quilt and bind it. The bumper is 80% there and the sheet needs a casing and elastic. 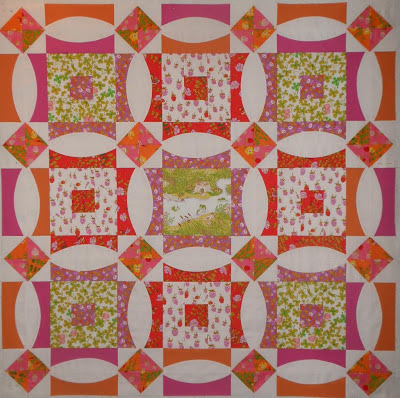 #6 Taffy in Ride , a Jaybird Quilts pattern using Julia Rothman's collection Ride from Windham. This hit a road block with no progress and I was so - so - very excited about it, especially those chains! I got all confused about what parts I've made and what is still needed, it's been tucked away ever since. X-Plus, project #7 really needs done because I want to enter it in our second annual MQG show with a turn in date of late August. 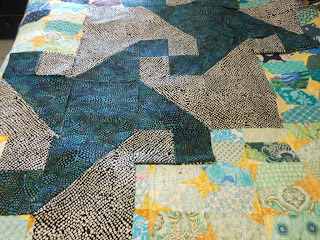 Mixing the jumbo and standard sized blocks will be fun and I just need to sew 3 more big ones before I can do layout, piecing, quilting, binding, label, hang sleeve... you know the drill. #8 is a low pressure deadline - open ended really. 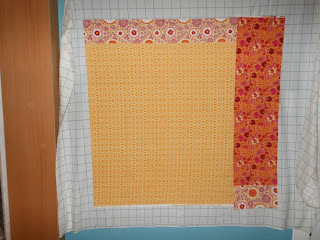 Our MQG is doing a Sparkle Punch QAL. The final #9 Rip Curl is the oldest of the UFOs in the bunch. The top is done and the back - well, it's in parts and in my head... a big floor quilt for my son so his baby can be a surfer girl right from the start. 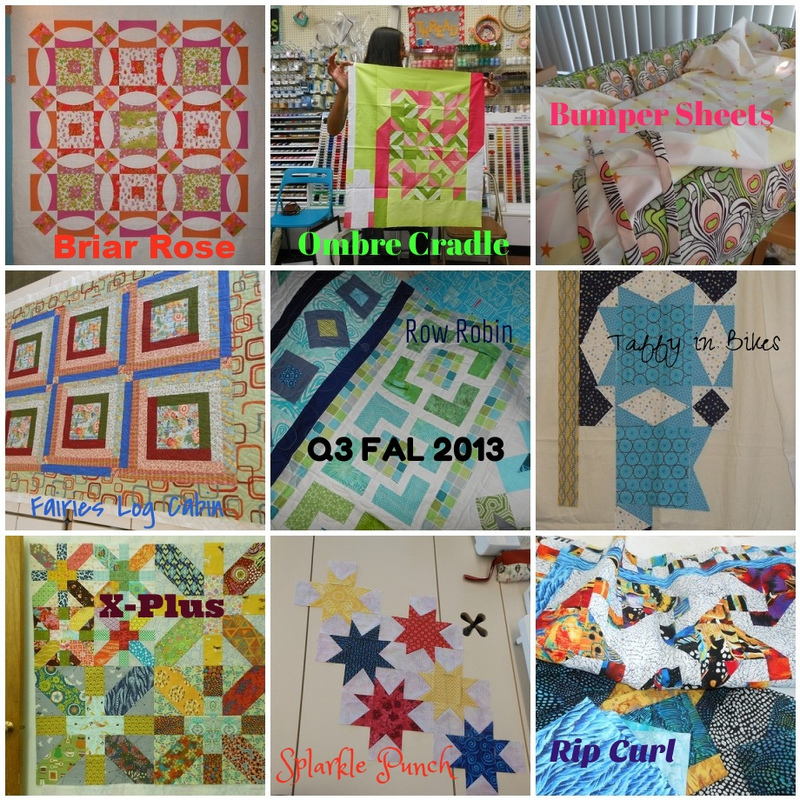 So there you have it: 9 projects in 3 months - that's not so many, right?! Be a cheerleader for Leanne at She Can Quilt and all the participants at the official Q3 Goals Link Up Party.